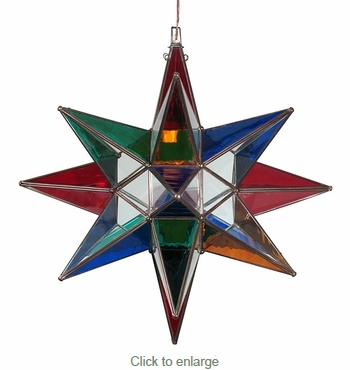 Add a colorful glow to any room in your home with this clear glass and stained glass star light. Hand crafted in Mexico, our artisans hand cut each piece of glass for this beautiful hanging lamp. Whether your d�cor is a southwest theme or a modern ranch, this starlight is the perfect accent. This extra large starlight can be used as an entryway chandelier.